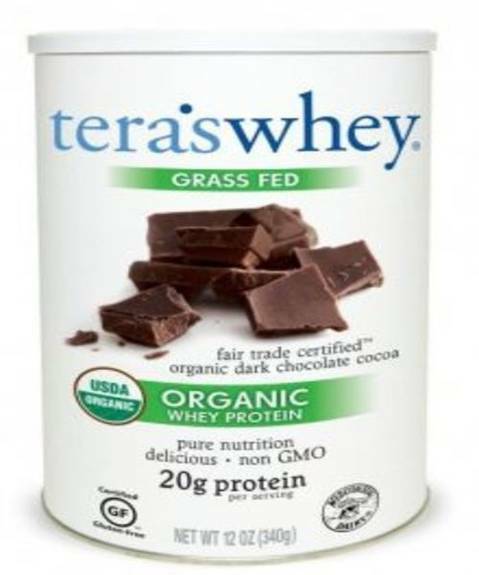 Tera'swhey Organic Whey Protein, Fair Trade Certified Dark Chocolate Cocoa, Is Certified Gluten-free, Kosher-dairy And Usda-certified Organic. Every 12 Oz. Canister Of Dark Chocolate Cocoa Whey Protein Is Made With Grass-fed, Rbgh/bst-free Milk. Each 2-scoop Serving Provides 20 G. Of Protein And 10% Each Of The Daily Recommended Values Of Calcium And Iron. See Nutrition Facts Panel For Allergens.